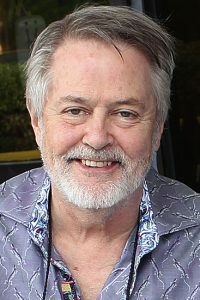 Legendary author and editor Michael Moorcock turned 75 on December 18, 2014. 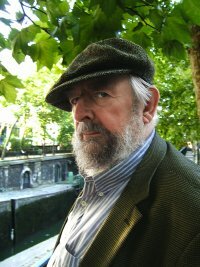 In celebration of his lifetime of tremendous (and ongoing) contributions to SF and fantasy literature, Locus’s December issue gathers tributes and retrospectives on his life and work to date, as well as a look at what comes next. He has a new novel coming from Tor, plus reprints and new material from PM Press, and British publisher Gollancz is engaged in a major project to republish all of Moorcock’s genre fiction in new, definitive editions. 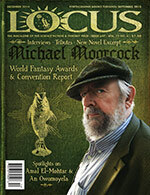 In addition to appreciations by Harlan Ellison, Alan Moore, Norman Spinrad, Iain Sinclair, Jeff VanderMeer, and the late Andrea Dworkin, the issue has an interview conducted with Moorcock last month by artist John Picacio, an overview of Moorcock’s life and work by scholar John Davey, an excerpt from Moorcock’s upcoming novel The Whispering Swarm (Tor) and an interview with Ramsey Kanaan of PM Press, which is publishing a great deal of Moorcock material. Our enormous thanks to John Picacio for his assistance. John Picacio: Let’s talk about your forthcoming novel The Whispering Swarm. From what I’ve gathered, creating this book was a long journey, especially considering how fast you’re used to working. As a visual guy, I see a grail on the cover and I’ve seen you note somewhere online that there is no grail in the story, so I’m even more intrigued now. 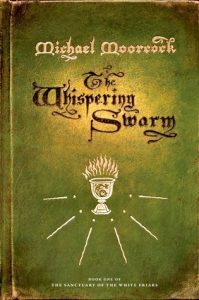 Michael Moorcock: One of the characters in The Whispering Swarm specifically says, ‘‘We’re not talking about the Holy Grail, you know.’’ It’s a different kind of cup. It’s shaped like a fish, sort of soaring up towards the surface of water – it’s called a Fish Chalice. In my mind it’s based a bit on Japanese stuff. The cover has absolutely nothing to do with what’s inside. They knew there was going to be a chalice in it, so they decided to make it a regular, chalice-shaped chalice. We’re hoping the paperback will have a more appropriate cover. JP: What’s the book about? MM: The book is partially autobiographical. That was the most painful part to write. Then there’s a fantasy element, which is the Alsatia, a part of London that is not seen by most Londoners, which has a historical origin. The Alsatia was called that because Alsace lies between France and Germany and is neither one place nor the other. The Alsatia in London is neither London nor is it not-London. It was a section between the Fleet River and the Thames, in that area anyway, by Blackfriars Bridge. It was given to the Carmelites in the 13th century, when they were expelled from Mount Carmel by a particularly zealous regime. You couldn’t have any monks living on Mount Carmel, so they all came over to England and France and were given land by princes who wanted to show off their piety. Those lands constituted the Abbey, however much land had been granted. It was part of a church, which meant it was also a sanctuary. Over time it became a thieves’ sanctuary. Such places have always existed to a degree in European cities, and even in New York and other places they’ve spontaneously developed. Usually in cities like that, for one reason or another, the land is not considered part of the city or indeed of the state. There’s one part of London that’s actually part of the Portuguese embassy, and that grew up into a thieves’ warren, too, over time – so Alsatia is a real place. It features a lot in highwayman fiction of the 19th century, because that’s where they all went to regroup. In reality, it ceased to exist in the 19th century, but in my story it’s still there, and still thriving pretty much as it might have done in the 18th century. Only you can’t see it. The rest of the book is essentially historical fiction. It’s an attempt to rescue Charles the First from the block where he’s going to get his head cut off. That’s the political aspect of it, too, because I’m dealing with the English Revolution in terms of how it prefigured the American Revolution. I’m trying to talk about the American Revolution as well as the English Revolution. The same slogans were used in both revolutions: ‘‘Don’t tread on me’’ was used by the English revolutionaries; ‘‘No taxation without representation’’ was also used. You can tell it’s ideologically pretty much a direct continuation of that revolution in America, where it took hold. The English revolution went to America, and became successful. We lost it in England. JP: I love it. You talked about how there’s an autobiographical element to this piece, and how there was some pain in developing that part. Do you want to go into that a bit? MM: The autobiographical stuff was painful to write, partly because I deliberately set out to face my own ghosts, my own past. Partly because of the people who are still alive, such as my children, whose sensibilities I don’t want to offend, I couldn’t be as direct as I might have been about my first marriage, for instance, because to do so would have upset my children, and I would rather not do that. Their mother doesn’t talk about events very much, which means I can’t talk about those events, either, because then the kids would only be getting my story. It’s a very fine line I have to tread between remaining truthful and not giving my opinion too much about my first wife. In this particular book I deal mainly with my life to around the age of 30. I deal to some extent with New Worlds and the writers around New Worlds, my early trips to the United States, the publishers, and the per­sonalities at the time, mostly using their real names. A few of them do not have their real names for obvious reasons – or I need them to be slightly fictionalised for purposes of plot or not to hurt feelings. It goes up to 1969 or 1970, something like that. I am curious to find out how readers respond to this book, because it seems to me very different from anything else I’ve done before in long form. JP: What’s the next book called? MM: The Woods of Arcady. The title comes from Yeats, a rather elegiac poem about how the woods of Arcady are disappearing, essentially about how the old stories are disappearing from the world. Yeats was seeing it in a particular light, and I’m seeing it in a different light, but I’m using his poem. Yeats was mourning the death of Romantic Ireland, as he did in a number of poems: ‘‘Romantic Ireland’s dead and gone / it’s with O’Leary in the grave.’’ He was seeing Ireland becoming more realistic as it fought for independence, essentially – that’s what he was seeing. I might be looking at fantasy and wondering how far from its mythological roots generic fantasy has actually strayed. I’ve always been an advocate for remaining close to your literary and cultural roots. I’m talking about not so much the death of fantasy as the diluting of fantasy. I call it Xeroxing, where you’ve made too many Xeroxes and it’s fading to the point of invisibility, almost impossible to read. Generic fantasy now tends to feed off itself, the way science fiction did, the way genre almost inevitably does. I’m not saying this is true of everybody, but it is of most people who are writing generic fantasy or SF because they’re enthusiastic about somebody else’s books, rather than about, say, Indian mythology or African mythology or Norse mythology or Jacobean plays or narrative poetry or Regency gothics so that they understand the roots of the genre and so add real vibrancy to their work. JP: Titan is about to release the first sequences of The Eternal Champion. That’s a great gateway for anyone who’s intimidated by the scope of your work. What’s the overall storyline? MM: The Eternal Champion is someone who is reincarnated again and again through the multiverse having committed a great crime for which he is punished by serv­ing the Eternal Balance, either for Law or for Chaos, whichever needs the most help. We all know what a multiverse is these days. The great crime isn’t necessarily the crime I describe in the book. In a way he’s seeking forgiveness for what he did. It’s impossible. He can’t ever find forgiveness for what he did because it’s inevitable – what occurs, occurs. But he’s constantly reincarnated throughout different universes and different parts of the galaxy. Some stories are full-blooded adventure fantasy while in others the Champion can be a modern man and there’s no fantasy to speak of. JP: I see a lot of fantasy authors credited as worldbuilders, and many cite you as a major influence on their work. I’ve heard you say you don’t do worldbuilding. What do you think is being missed in translation? MM: I think the notion of worldbuilding is a failure of literary sophistication. Take the Romantic writers of the 19th century, particularly the Brontës. The Brontës loved the idea of depicting weather to suit moods – it’s called the pathetic fallacy, where you give inanimate things animate qualities. The point of that style of writing is that it used landscape and weather, all exteriors, to symbolize internal con­flict within the individual or within a small group of individuals. I only invent what’s necessary to explain the mood of a character. I haven’t thought about an imaginary world’s social security system; I don’t know the gross national product of Melniboné. If worldbuilding is a sophisticated working-out of how a world interacts in and of itself, I don’t really have any of that. People interact in my worlds. Weather systems interact. The weather system is always sup­posed to show what’s going on inside the character. That’s why I don’t see myself as a worldbuilder. The world unfolds in front of the character as the story develops. If the story doesn’t need it, it’s not there. I’ve fought against this kind of anti-romantic rationalization most of my career. That’s why I don’t like Campbellian science fiction as such, because it has to present itself as a pseudo-realism to create a suspension of disbelief. I’m trying to do the op­posite. I’m trying to tell a good story without you having to believe it as ‘‘reality.’’ Cornelius in par­ticular depends on you NOT suspending your sense of disbelief! Most science fiction tries to rationalize something so you believe it as reality and frequently ruins the great visionary quality which inspired it. I’m describing reality, but it isn’t a construct. I’m not trying to convince you this is going to be real. I’m trying to convince you that these ideas have to be considered, that what’s going on in the world has to be thought about. The conscious life is all I’m advocating. Read the complete interview, in the December 2014 issue of Locus Magazine. Photo by Linda Steele. Unfortunately for Moorcock, character is inseparable from the social world, which is itself inseparable from the physical world. He can claim to be advocating a conscious life and trying to convince you that “what’s going on in the world has to be thought about.” But starting from such a falsification of the very notion of character is self-defeating. He’s left doing daydreams, fundamentally no different from Campbell’s conquering hero fantasies. 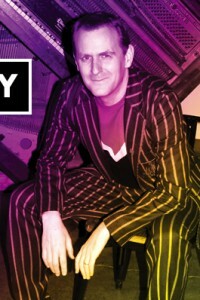 Despite Moorcock’s popularity as an editor, most of his product is trivial and ephemeral, vitiated by his boneheaded stupidity. “Behold the Man” was pretty much it. Such a shame. Seems to be a pretty nice guy, though, which counts for a lot.